This spring (spring is coming, right??) will see a wonderful variety of gallery exhibits, lobby exhibits, and programs at the JMM … which means that the Collections team has been keeping busy, and you’ll soon see the fruits of our labors. It also means that much as I enjoy deep dives into artifacts and documents for the blog, I’m going to keep it short this time, and simply show off a delightful little object, apropos of nothing in particular. Blanche Bamberger Spaeth, daughter of David and Johanna Bamberger of Baltimore, received this signature vase in 1893. 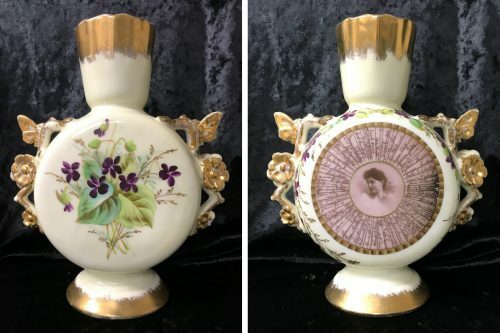 It features handpainted violets on the back and sides; gilding on the neck and the exuberant handles; and, on the front, a transfer printed wheel of signatures. Next to her photo, in the center, she noted “My Baltimore friends,” with the date. 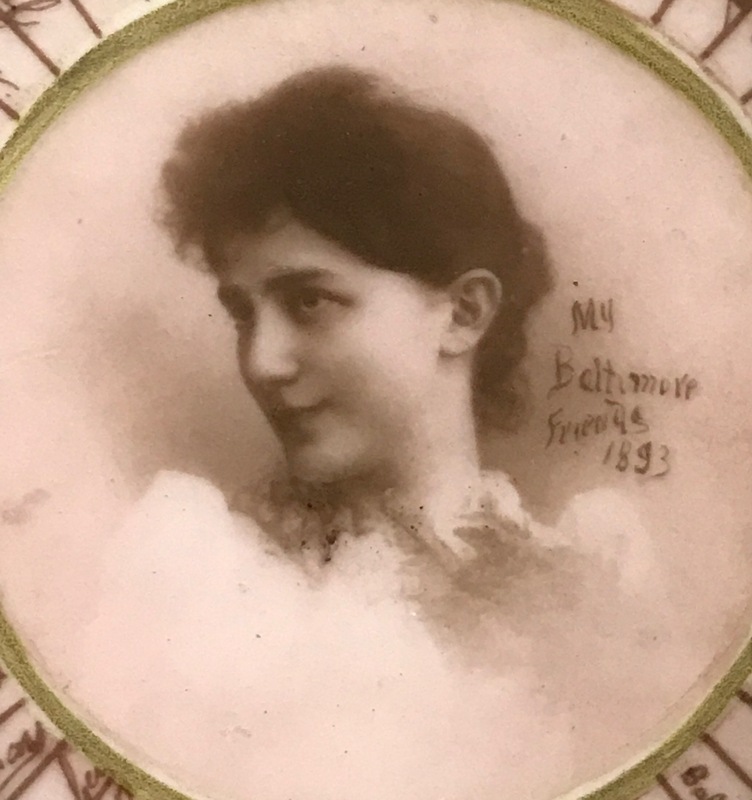 Her granddaughter, the donor of the vase, believed it was a gift for Blanche’s 18th birthday, but some inconclusive census research shows that she might have been a few years older in 1893, and indeed she’d been married for three years at that point; on December 7, 1890, she and Joseph Spaeth were married by Rabbi Henry Hochheimer of Oheb Israel, Baltimore. The donor told us that as an adult, Blanche lived in Switzerland and Germany for many years; I wonder if this vase was actually a going-away present from her “Baltimore friends.” According to the Smithsonian Gardens, purple violets signify “thoughts occupied with love,” which seems like an appropriate sentiment for such an occasion… or it was just the design that the friend tasked with securing the vase liked best. 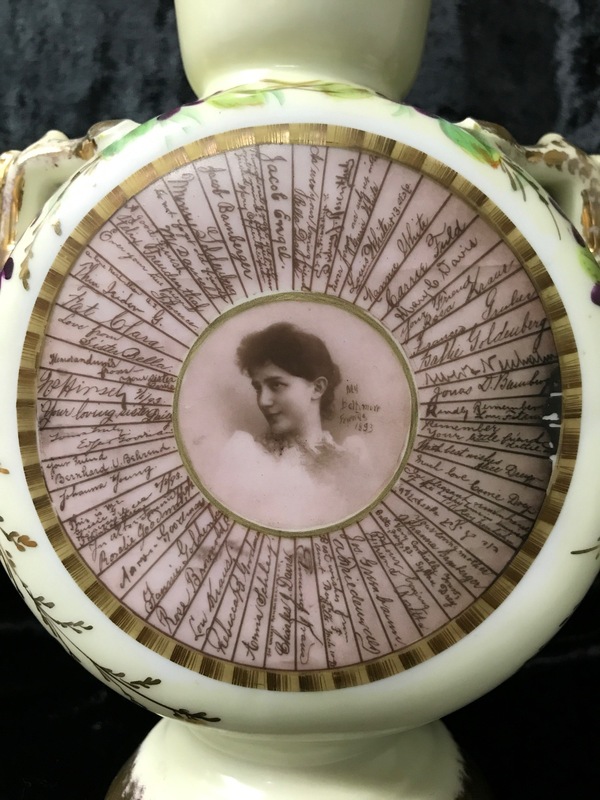 Either way, our next task is to start identifying the signatures – I’ve spotted her brother, Jonas Bamberger, along with a few other familiar names – and using them to build a better picture of the life of a well-to-do young lady of Baltimore in the 1890s.